Friends of the National Park Foundation’s (FNPF) runs habitat restoration projects in Kalimantan’s Tanjung Puting National Park, the largest national park in southeast Asia, and in Lamandau River Wildlife Reserve. 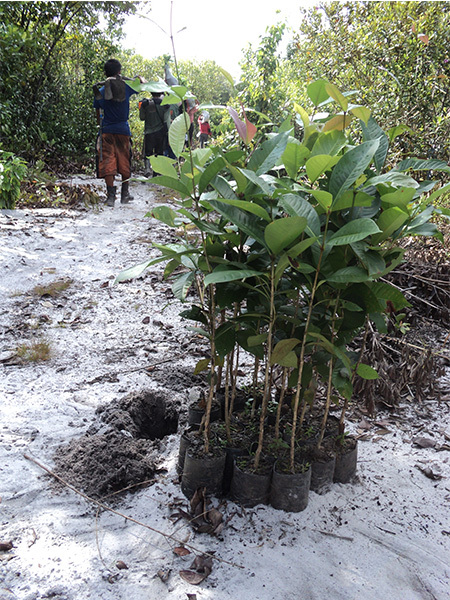 Planting trees in Tanjung Puting National Park. Our reforestation sites in Tanjung Puting are at Pesalat and Beguruh. Our agroforestry demonstration site is at Jerumbun, just outside the national park. Pesalat is our longest running site in Borneo. It is located about 45 minutes by boat upriver from Tanjung Harapan (also known as Sekonyer village) and about 15 minutes down river from Pondok Tanggui. There are orangutan rehabilitation centres at Tanjung Harapan and Pondok Tanggui. Prior to the national park’s extension in 1984, Pesalat was an area of traditional slash and burn farming. When our project began, the area was severely degraded – completely cleared of trees and overrun by imperata grass. Despite being surrounded by secondary forest, natural forest regeneration was unable to occur because of the imperata grass, an aggressive weed that overpowers any tree seedlings and prevents them form growing. The area is mostly flat and includes both peat swamp and dry land. Since 2000, our focus has primarily been on reforestation in the dry areas, which were once dominated by Iron Wood trees. We have planted on over 50 hectares, initially planting 400 saplings per HA, and then planting additional saplings almost every day in order to increase the density and diversity of the trees, and to replace any dead saplings with new ones. In addition to the reforestation work, our team also maintains the park infrastructure on behalf of the park management. The site includes a conservation education centre and the camping ground in Tanjung Putting National Park for visitors. During the first three years after planting, our staff ensures protection for the young saplings by cutting back the weed grass that grows so aggressively in areas where native forest has been cleared. After three years of post-planting maintenance and care, the saplings are strong and large enough to grow independently and without risk from being suffocated by the weed grass. After monitoring the progress of our initial saplings, we have found that the survival rate is currently about 73%. Farmers on lands bordering the national park (and also those illegally farming within TPNP) that use slash and burn methods are the primary cause of fires spreading into the park, and have created a severe fire risk for the area. In order to maintain order, constant monitoring and prevention of fires is required. Fortunately, our good relationship with the community has encouraged its members to assist us, both in terms of monitoring and helping to extinguish fires and/or preventing them from spreading. While patrolling the adjoining forest areas, our staff constantly collects seeds and seedlings to take back to our nursery, or to the village cooperative nursery. Collected seeds are planted in seed pads in our nursery to produce seedlings. Later on, these seedlings and those collected from the forest are planted in the nursery to grow saplings for planting. Currently, we are focusing particularly (but not exclusively) on producing more Iron Wood saplings because this region used to have a lot of Iron Wood trees. This allows an increase the density and diversity on the planting site. Education for visitors focuses on the challenges and goals of the conservation project. The Beguruh site is a mixture of dry land and wetland peat swamp. Our dry land reforestation site is about one hour’s walk from the Tanjung Harapan orangutan rehabilitation and release post, and our wetland reforestation site is an additional 30 minutes away. As with Pesalat, the area is severely degraded of trees, with natural tree regeneration restricted by the imperata weed on the dry areas and by blade grass and ferns in the wetland peat swamps. Beginning our work in 2006, by 2010, we had planted and maintained 50,000 saplings on 125 hectare of dry land (400 per hectare). Our survival rate after three years is over 70%, and our staff continuously replaces dead saplings with new. Plus our staff plant additional trees on almost a daily basis to increase the density and diversity of the trees. In 2009, we began planting on a 40 hectare site of severely degraded wetlands, but the project was a challenge since reforestation on wetlands had never been done before in TPNP. The five years prior to launching the program were spent carrying out numerous wetland planting experiments in order for us to gain experience and developing a planting method for the project. 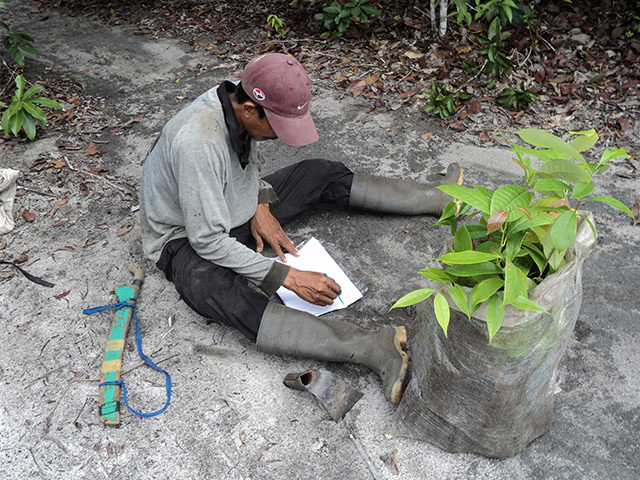 Though our knowledge significantly increased, reforesting a wetland peat swamp still presented a host of challenges that were very different than those faced on the dry land. Access to the planting site is extremely difficult because it is swamp for most of the year. We can only plant in the dry season when the area is accessible. During the wet season the area is covered in swamp water. The saplings that we plant must establish themselves and grow tall enough during the dry season to survive when the swamp water returns in the wet season. Most of the wetland is covered by ferns and “blade grass”, which makes natural regeneration almost impossible, and means that we must continuously cut back and clear the weeds from suffocating the planted saplings. The “blade grass” is extremely sharp and cuts the feet and legs of the staff, making work in the area very difficult. Additionally, the grass will suffocate the saplings unless we repeatedly cut it back. Just like in Pesalat, we monitor and maintain the saplings for 3 years after planting, after which we expect the trees to be large and strong enough to grow independently. All saplings that die are replaced with new saplings. Fires are a major threat and more dangerous than in the dry areas, because of the underlying peat. Once peat ignites, it can continue burn for months (or even years) and will only be put out if there are extended periods of heavy rain. This work has been possible thanks to our donors, including the Humane Society International (Australia), Taronga Foundation, Boeing, Save Indonesian Endangered Species, and Eco Future Fund.